The CB808 is the TR-808’s analog cow bell sound generator adapted for Eurorack. 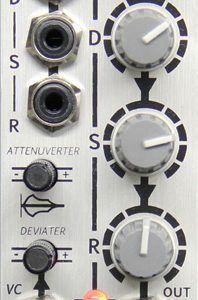 It’s a low-cost module that brings back that classic Cow Bell tone and continues to expand your Tiptop Audio modular drum machine. Just like the other drums in this series, adapting the circuit to the modular format has allowed TTA to add some special features like Pitch Modulation, LFO (with control over rate and depth), independent Accent levels, a high-powered Gain stage, and a dual-input Pulse-shaper – all without compromising the signature sound of the TR-808’s spacey cow wow. The CB808 sound is generated by two square wave oscillators that go through band pass filtering and then get mixed together. 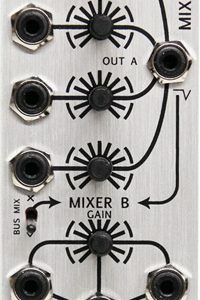 It’s a simple analog circuit with a very cool output. What makes the 808 Cow Bell sound so well known is that it doesn’t feel constant, but rather slightly spacey. The internal pitch-modulating LFO added takes this effect even further, but stays within the bounds of the 808 sound, keeping it very musical and easy to play with. Compatible with all the other drums in this series, the CB808 includes a high-powered output Gain stage capable of producing hot signals that can be easily distorted if desired. On the inputs, TTA have designed a dual-input Pulse-Shaper circuit so you can trigger the CB808 with trigger/gate signals from step sequencers, clock dividers, or any other pulse/clock sources. This eliminates the need to shape pulses sent to the module and ensures the same stable sound at peak power, regardless of your pulse source. 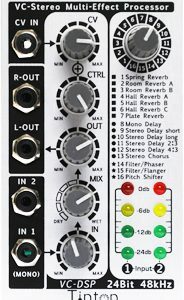 All these unique features make integrating this legendary sound generator into your modular synth easy, unleashing the power of real analog drums.